visionkingcn01 has no other items for sale. хорошая упаковка. товар соответствует цене. Monocular is great for focusing on close objects and works for distance too! 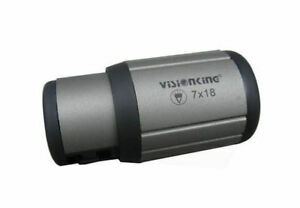 Excelente monocular, excelente calidad óptica, compraré otro. A+++ Shipped quickly, packed very securely, as described. Fantastic! The close focus works great and the long distance works as advertised. I would rather the overall power was reduced a bit because it is hard to hold it steady enough, but the compactness and lanyard is essential. If the optics were good this little scope would be a gem. You get a monocular and a microscope in one small, affordable package. I bought 2 and one had fairly good optics, the other somewhat poor (a ring way from the center was out of focus). I bought 2 more, hoping they would be like the first. But they were both terrible with no sharp focus at all. Because came from China return shipping would be expensive.